without snow? It is mild outside so it feels very hot inside the building. "True Grit". The tickets for huge cinema have already sold out. I think it is perfect that the brothers are doing a stage greeting. 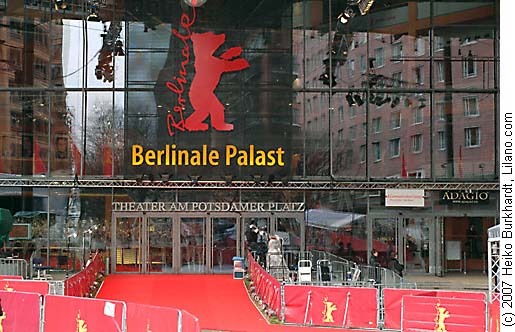 which is one of the big three international film festivals in the world. and the live performances on the film festival website. just as well over the internet live streaming. I wrote in a previous blog "Hollywood Pay Attention!". J.C. Chandor has arrived in Berlin. his press conference and photo-call. By the way, the film market is unusually quiet. It seems that the Asian buyers are altogether non-existent. In spite of it being the first day, the attendees are very, very few. "Business is dead", and looked very bored. the life of Fado singer, Amália Rodrigues. music seems to be only for the hard-core fans. Then" I'll tell you a secret if it is unsold on the last day of the market". I said it suggestively and left it there. Fado was born in the port town of Lisbon. old women cook beside their kitchen doors. Japanese Enka song, which is a traditional style of Japanese popular song. which deeply effects the people's emotions and is beautiful. "the world is wide, it is not a stranger". around the world that make us light-hearted. I am so sleepy due to jet-lag. films to the global market. Copyright 2019 pictures dept. official blog. E！ all rights reserved. Designed by from fm in blog.